There have been numerous studies done over the years regarding the effects that music has on the brain, and how these effects affect work performance and motivation. Those who listen to music have been proven to work faster on average and to have a higher level of satisfaction in their work. In fact, in a study published by the Society for Education, Music and Psychology Research titled The Effect of Music Listening on Work Performance, researchers found a stronger correlation between music, mood, and work productivity than anyone had ever imagined previously. So, regardless of whether you are tapping away on a computer or banging away with a hammer, work gets done just that much easier and faster when the tunes are playing. So it is proven that having something to listen to while on the job site not only helps the individual worker – it also benefits the management wishing to maximize the productivity of their team. This is the reason almost every major tool manufacturer now produces a powerful, durable and reliable worksite radio. The net productivity on a worksite from a bit of music can put to shame the benefits of even the best individual power tools. Since every major tool company (and others) now make great worksite radios, in can be hard to sort through all the options to find the very best ones. That is the mission behind this article today. While I will spend some time going over frequently asked questions, and the parameters for what makes a good work radio towards the end of the article – the meat of this is going to be comparing and ranking the ten best worksite radios we can find. Most of the brands will put out multiple radios with only minor technical differences (think a family of products), and effort was made to avoid ranking these near duplicates on the same list. For example if one ranked #1, it would stand to reason that all the other offerings from that same family would fall into, or near to, the #2 or #3 etc. positions. This is not an exact science, as some radio families seem to differ substantially in shape, price, and product even within that family of goods itself. Suffice to say, if a radio was overly similar to a related product from the same brand we tended to avoid near-repeat reviews. One last note, the ranking for this list last was done in with a price/value ratio. Although some radios on this list may be significantly better than others, that doesn’t mean they will automatically rank higher. If a slightly inferior radio costs much much less, it was deemed to be a better overall value – all the radios on this “Best of” list, however, are of course quality products well worth the purchase. The Bosch PB360S “PowerBox” is a powerful device in more ways than one. It provides clear, loud, 360-degree sound. It is protected by a solid rubber roll cage and weather resistant engineering. It can charge your Bosch 14.4V to 18V Li-Ion batteries and offers four onboard outlets which you can plug your power tools into. It will run on your Bosch batteries or can be plugged in (necessary for charging and outlet functions). Its Bluetooth compatibility even stretches well over 100ft. It also has a media bay for safe storage of your devices. 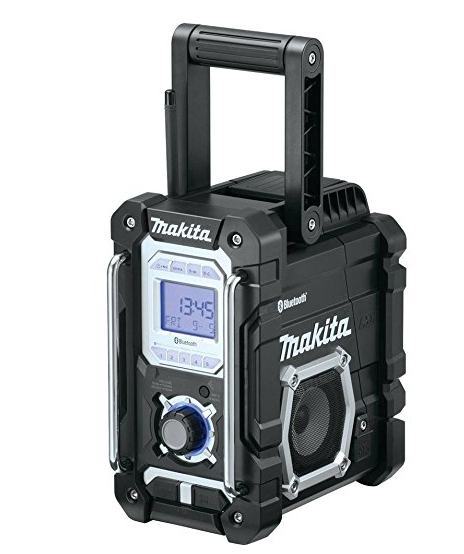 These features all crammed into a mid-sized package make this not only the perfect jobsite radio, but it also makes it a great outdoor radio for everything from kickball games to weekends at the river. 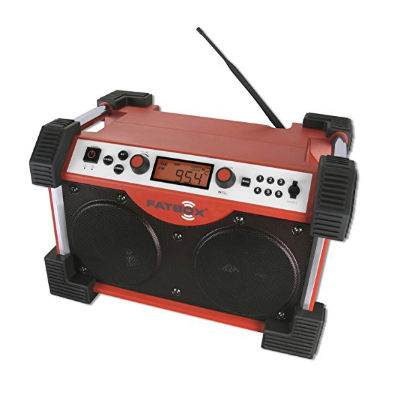 The ability for this radio to not only entertain but to charge batteries and power tools make it a fantastic centerpiece for the worksite - and the protective casing and design means you don't have to worry about it getting too close to the action. If your site runs off Bosch, you should heavily consider the little wonder. It will easily improve the waulity of life on your worksite. 3-7 hours of runtime per battery (dependent on volume/use). If you already carry Bosch batteries, the value of this device is undoubted. If not, this is still a fantastic radio that can last in extreme conditions, power your tools, and withstand fairly harsh elements. You won’t be wasting a dollar. Bosch powered worksites of course. This is simply a fantastic all-around outdoor radio for a whole plethora of activities. Beach days, BBQ’s, Garage work, etc. This is the perfect choice when a standard radio will either succumb to the elements or is at risk of being smashed by a tool. The ToughSystem family of products allows one to customize and perfect their loadout for any job with easy to stack and move storage and utility devices. This family of devices makes it easy to move from site to site and lets you rest easy knowing everything is protected from the weather, damage and theft (if you decide to lock it up). The Tough system radio fits snugly into this line of products. Outside of the Tough System family, this is still a robust and efficient worksite radio. Loud, tough and very portable. It also sports a very long battery life and charging capabilities for Dewalt products. Bluetooth-enabled up to 100 feet. It can be a bit on the expensive side for what it offers, but if you already have a series of ToughSystem products, then this is a reliable and valuable purchase. It is in tandem with these other products that it really shines. 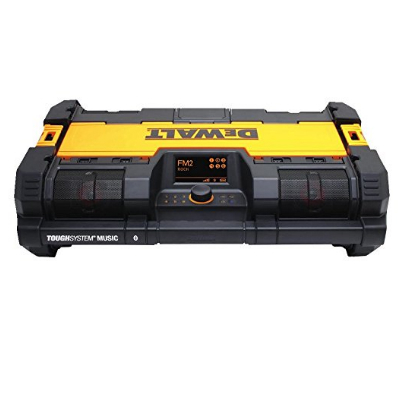 ToughSystem and/or Dewalt battery users - or those who need a low profile, easily portable worksite radio. 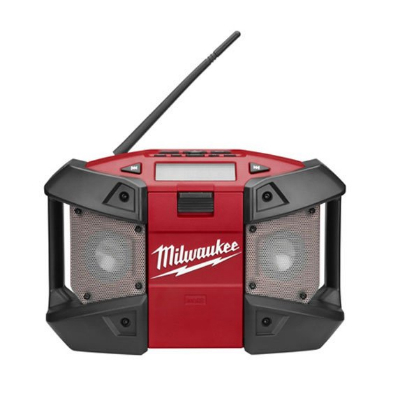 The Milwaukee M12 is a reliable compact radio, with all of the quality and craftsmanship of the Milwaukee M18 but in a device about half the size. The M12 series is known for delivering quality products in small portable devices. All in all, this is an excellent quality worksite radio that is very resistant to rain and moderate bumps and bruising. It does not have all the bells and whistles of its larger cousin, but it gets the core job of a radio done nicely. Arguably the best of the small range worksite radios. Power: M12™ REDLITHIUM™ battery packs or AC adaptor. The Milwaukee M12 Cordless Jobsite Radio is a great radio when that is all you are looking for. If you don’t need the large central work hub devices that ranked higher on this last, but rather just a durable, quality sounding emitting device for a worksite- this is the way to go. As long as you don’t have an extremely noisy worksite, this can be a great addition to your team. It works with the Milwaukee M12 batteries, so it makes sense as a purchase if you are already utilizing that tool suite. 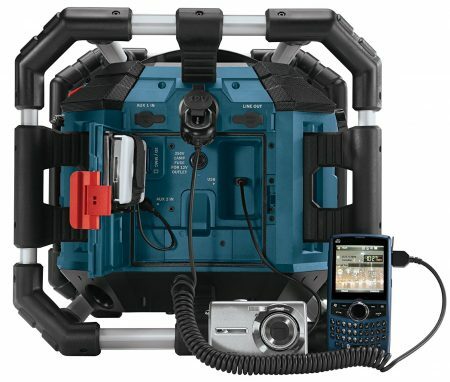 This Makita radio is part of the LXT lineup of cordless tools developed in 2005. This whole series is based around powerful cordless devices with long-lasting batteries. This radio fits into that description nicely. It’s durable, portable and one of the best mid-range offers available. It is clear that Makita spent the time to make sure that this radio matched the same durability and quality their premier series of tools has become known for. Runs up to 20 hours with an 18V LXT Lithium-Ion 5.0Ah. One auxiliary port for MP3 compatibility and one USB port for charging your mobile device. This is possibly the most bang for your buck at the mid range price range. You get a quality radio with some good features and sound output but at less of a price than the central work hub style devices. Those who either enjoy that Makita set of tools or are looking for a more powerful radio, but not necessarily one that comes with all the possibly unnecessary bells and whistles. This Dewalt comes packed with all the features of the best radios. 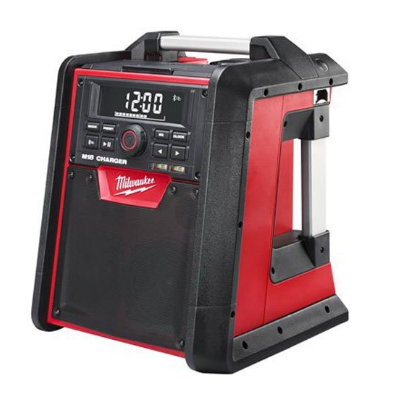 Tailored made for a job site - the battery charging capabilities, added outlets and a large number of possible hookups make this a fantastic portable hub that can accomplish a number of worksite needs - oh yeah, it's also a radio too. 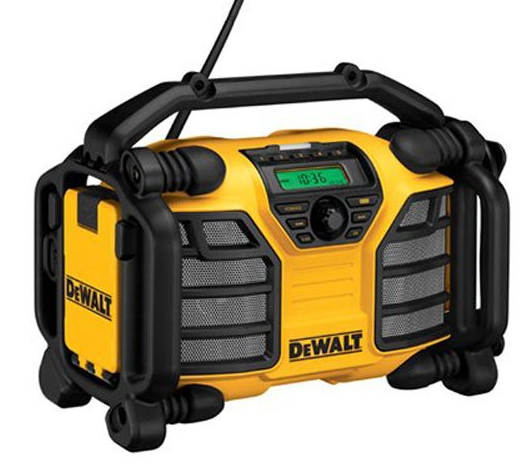 Strong, loud, portable, and packed with features - this Dewalt gives any of the other radios a run for their money. The only reason it is so low on the list is that it doesn’t scratch any new itches from what we have already covered in our selection. Suffice to say this is perfect for the Dewalt Powered worksite and contains most, if not all, of the features you could possibly look for in a worksite radio. Class D woofers, amplifier and tweeters. Enabled connection to CD,Portable Satellite Receivers, MP3, and other devices. Device storage compartment to keep electronics safe. This is a fantastic higher end radio that warrants its price tag. 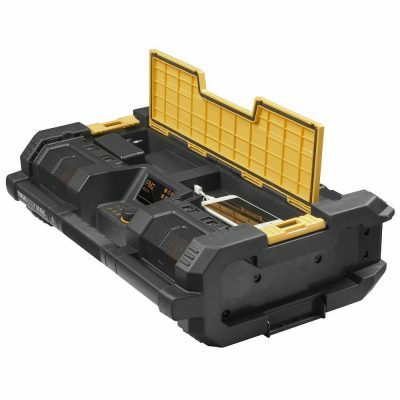 If you use Dewalt batteries, then this is probably a no-brainer unless you are already considering another Dewalt equivalent. 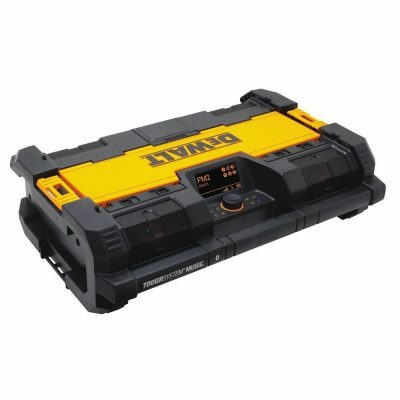 This product generally comes in at a little less than some of the higher end radios - and may be a better deal than its peers even if you don’t use Dewalt batteries. Dewalt powered worksites who need a power and entertainment hub for their work area. Safely store devices, power tools and charge batteries all from one easy to use and centralized hub. Just as the Milwaukee M12 was a minimized Milwaukee M18, the Bosch PB180 is a minimized Bosch PB360. This is another exceptionally high-quality compact worksite radio that has eliminated some features in order to maintain a compact size and a lower price point. Although it lacks the bells and whistles of larger worksite radios, it ensures it does its job stupendously. The has magnificent reception and is very loud for such a small frame. It also comes with wall mount compatibility allowing you to create a permanent space for it in your garage or worksite. As long as you're not running it at full blast, the Bosch PB180 can have up to two days of runtime off of a 4.0Ah battery. External AUX port allowing connectivity to digital media players. Like the Milwaukee M12, this is a radio that has been purposefully minimized to do only what needs doing. Its an extremely high quality radio at half the cost of its larger worksite cousins. 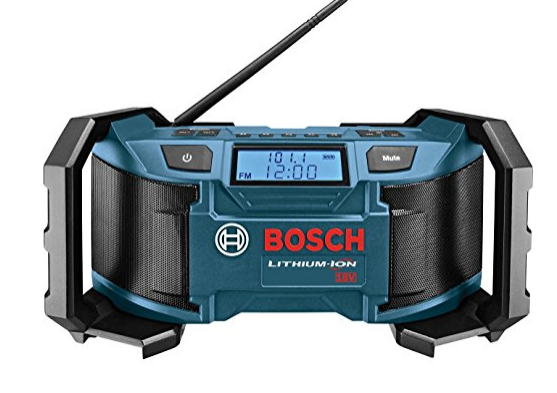 If you need a fantastic smaller work radio, and/or already utilize Bosch batteries, this is a great buy. 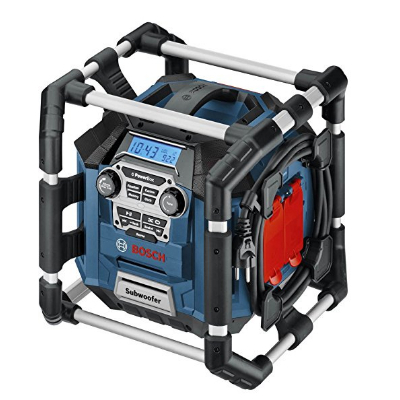 Bosch users, those who want a great wall mounted radio for the garage or worksite - or somebody looking for a quality worksite radio at a great price. You can best sum this radio up as the Milwaukee version of the Bosch we just reviewed. This Work Radio is durable, clear, and a boon to the worksite in more ways than one. It has a built-in battery charger for your Milwaukee REDLITHIUM™ batteries as will as an onboard protective area for phones and other small electronics. The Bluetooth signal works from over 90 ft. away. This Jobsite radio is also conditioned to take a beating with shock absorbing end caps, metal speaker grills, and a roll cage. It is well suited to handle mild inclement weather as well. The Milwaukee M18 is everything a jobsite radio should be. Clear sound, affordable, high durability, and a host of useful features that demonstrate its creators understand your needs. If you already own a suite of Milwaukee tools, this is the perfect addition to your repertoire. It even has a built-in bottle opener. Shock absorbing end caps and metal speaker grills. Digital AM/FM tuner with 10 station presets. 2.1A USB Charger for all portable electronic devices. 3.5mm Aux In Port for wired playback. Up to 12hrs run time with an M18™ 5.0Ah battery. Though a bit more expensive, you could crash a forklift into this thing and expect it to keep going (In fact that has apparently happened before). 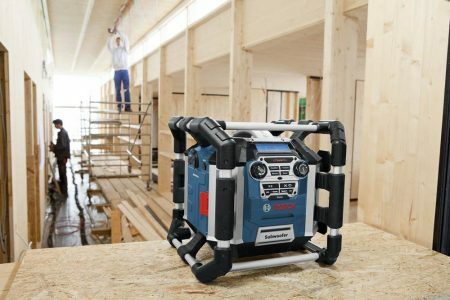 If you are looking for a high-end addition to boost the quality of your job site, this is the radio for you. The volume may be lacking for the noisiest of worksites, but outside of that, this is a great addition to the team, even if you don’t generally use Milwaukee tools. If you do use Milwaukee tools, this is a hard product to pass up. Rugged, waterproof, and solar powered. This radio falls more into a general party/outdoor radio category than an actual worksite radio - but it is definitely resilient and useful enough to make your life better on site. 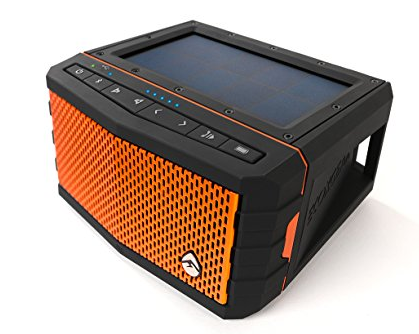 I wouldn't go so far as to call it “rugged” coming in at less than 5 lbs, but its small size, portability, and solar addition make it an excellent choice for a variety of scenarios. It is actually the most waterproof of all the radios on this list (it floats). Power: Solar, 2 Lithium Polymer batteries. 12 hour battery life outside of solar use. At a mid-range price, this is much more of a niche item than other radios on the list. If the specific benefits this radio delivers suit your needs, then it provides substantial value. Otherwise, you can argue it is a bit overpriced. I tend to think this would have been a great gift for my dad back when he used to be out repairing the fences the horses or cattle had torn down. The solar panels and mobility would have suited that job well. This is more of a feature specific item - so it could work very a broad spectrum of particular people. Well built and loud, this already hits the main criteria for a good worksite radio. On top of those obvious qualities, this relatively large radio comes with many features available only on the high-end radios, but at around half the cost. It would be underselling the device to say it is a discount version of the high-end job site radios - but it fits that criteria fairly well. utilize this device for up to 12 hours. Power: 14.4V -18V Hitachi Lithium Ion slide-type battery or AC cable. Two powerful side firing 7 watt speakers. Rated IPX4 water resistant for durability during light drizzle. 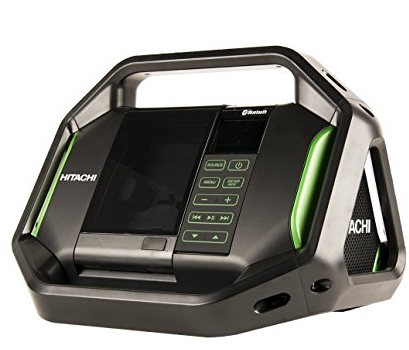 If you don’t expect to be smashing into your radio or needing it to be charging batteries or powering your tools, this may be the best option for you. It has plenty of the practical features - while leaving off some of the more heavy duty job site specific ones, and this seems to have lowered its costs quite a bit. If you work on a job site that isn't putting your radio at significant risk than the lowered cost will probably make this one a smarter buy than the high-end options. The Sangean FB-100 Fatbox radio is built tough enough for a war zone. It has a durable roll cage exterior made to withstand falls of up to 6 ft and 250 lbs of weight! It is sealed up in order to protect from dust and water damage (and has an internal port for safe storage of your phone). Unlike other radios on this list, the Fatbox doesn’t focus primarily on auxiliary devices or digital inputs, although it has access to those things, it also boasts a powerful receiver and booster allowing it to receive traditional radio signals as well, if not better than, any other radio on this list. This is a dynamic worksite design as well, it can charge universal D-size Ni-MH batteries and is loud enough for even noisy worksites. Rain Resistant to JIS4 Standard. 2 Aux-In for MP3, CD Player or iPod/iPhone. This is a loud, durable and efficient job site radio for a reasonable price. The price is on par with many of the other good radios on this list, and if you are looking for that extra level of durability - this should be your choice. If you need a loud radio and still enjoy actual radio stations, then this is the choice for you. Perfect for outdoor use or in close proximity to heavy tools. This radio is a real soldier. I just covered this a little bit, but I will elaborate. Value can be a pretty subjective thing given the situation or job you are working. I mean a Dewalt radio that uses the same batteries as your power tools may be immensely more valuable than a slightly better and/or cheaper radio that isn’t compatible with anything else on the worksite. Having said that we tried to work price into a value/output ratio. If a radio is roughly 75% as effective (volume, durability, etc.) as another radio, but 50% the price – then it can roughly be said that the radio provides a better overall value. Some work site radios will utilize power cords, some have solar panels, while others are compatible with the same batteries you use on your tools. Which version is more useful for your site is up to you – but we gave deference to the more versatile products. Radio is a dying medium. The selection and quality out there is only a fraction of what it used to be. Because of that, it is crucial that a good worksite radio allows individuals to hook up phones or other tech and play podcasts or music from their selections. Some will also have Bluetooth options, and/or can charge phones that are plugged in. These are all extremely useful features in today’s world. This is why you buy a worksite radio and not some plastic thingy. You need a radio that can withstand a hazardous environment. Armored outer layers, waterproofing, dust and dirt proofing, etc. A work radio is only as good as the work it can withstand being around. This is fairly self-explanatory. The higher the volume, therefore reach, the better. The overall quality of the sound at high volumes is also imperative. These radios are made to work in noisy environments and they better sound like it. Products with added sub-woofers, for example, got a deference. Should I Buy the Same Brand Radio as My Power Tools? Unlike staying brand loyal to companies that don’t actually give you a reason to past clever commercials, many tool companies have invested in proprietary battery systems that also overlap with their worksite radios. This isn’t the case for all of the brands or their radios – but if you have invested a lot of money into a particular series of batteries for your tools, then it makes sense that you would want a radio that can utilize those same products. How Waterproof are Jobsite Radios? While most Worksite radios will have some degree of water resistance, it’s important to note that there is a difference between “water-resistant” and “waterproof”. Due to the nature of electronics these days, there is typically always some way for water to negatively affect the product unless it utilizes extensive water protection. While the terms are sometimes used interchangeably, the typical rule is that something like a “waterproof” watch is made to go underwater for long periods of time without breaking down, while a “water resistant” phone or radio can be accidentally dropped in a puddle for a second or can accidentally take a spray from a hose with no side effects. Long story short, a water resistant worksite radio can handle some accidental spraying or even light rain, but it shouldn’t be left out during a storm or thrown into a swimming pool. What Features of Worksite Radios Should I Most Care About? This is entirely up to your needs. If you work outside with no overhead, then perhaps the solar powered device or one with good rain resistance is best. If you work with many individuals using a lot of power tools – then the battery charging aspects may be suited for you. Weigh your needs against what the radios offer. Do I Need a Worksite Radio? As was stated in the opening paragraph, studies have shown overall happiness and productivity increases when workers are able to listen to music. But do you need a worksite radio rather than a general stereo system? If you are working indoors painting, probably not. If you are outside with dirt, dust, heavy objects bouncing around and/or some inclement weather, yes. If you need a hardhat, your radio probably needs one too. This list should hopefully have given you all the features, tips and info you need to go out and make a smart worksite radio purchase. We know making larger purchases of this sort can be a frustrating and confusing experience with so many different opinions and conflicting reviews, but we have done our best to ensure that you are presented with the best quality items with a thorough justification for their inclusion. No one ever fully agrees on what the best tools are, and the goes for working radios as well – so whether you agree or disagree with certain aspects or opinions presented here, the hope is that they have helped you form your own views on the subject and led to a successful purchase. Weigh our options and always see for yourself if a product fits the needs you are looking for or need. If you do that, it is unlikely you will come away from any purchase wholly dissatisfied. So whether you are a site manager looking for the perfect moral boosting device, or a worker looking for something sturdy to plug his phone into, Good luck – and remember – build smart, build safe, and build big.